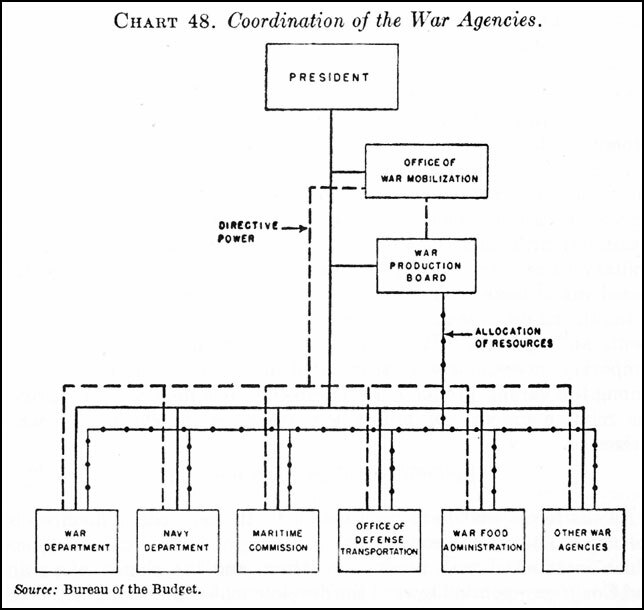 The problem of top direction of the war agencies of the Government became acute in the early months of 1943. Issues which could not be handled by any single administrative agency multiplied. Their solution required purposeful and coordinated guidance of action by related agencies. The upward pressure on prices was bringing a continued increase in the cost of living which stimulated strikes and threats of strikes. The munitions production curve was climbing rapidly. less and less was available for nonmilitary uses and a much more careful allocation of resources among civilian uses was required. The experts began to speak of "bedrock" civilian requirements. The effects of conversion of industry to war were being keenly felt. Farmers, for example, were expressing deep dissatisfaction about the declining output of farm machinery. Although problems at home were becoming more critical, urgent military and diplomatic matters made it difficult for the President to give uninterrupted attention to the management of home-front affairs. His participation in international negotiations such as the Casablanca Conference required time. Questions of broad military strategy were demanding his attention. The Axis forces in Northern Africa were being driven toward surrender. preparations for the taking of Sicily and Italy were under way and plans for the eventual invasion of the continent from Britain were taking shape. Director of Economic Stabilization in October 1942. Though he was appointed to assist the President in the management of Government agencies concerned with economic stabilization, his duties grew to include a broader range of functions. In the early months of 1943, for example, he participated in the settlement of disputes among the commodity czars. With his elevation to the post of Director of War Mobilization, he came to be popularly known as the "Assistant President." The question of machinery to aid the President in the direction of the Government had been under almost constant discussion since the establishment of the National Defense Advisory Commission in 1940. During the life of the Commission, a clamor was raised for "one-man" control. Eventually in the Office of War Mobilization a type of "one-man" control developed, but it was of a character not contemplated by either critics or responsible officials in 1940. It was the final product of successive stages of a tortuous evolution, an evolution feasible under a flexible administrative system which could sooner or later be adapted to emerging demands and which could be molded within the changing limits of practical feasibility. In 1941 the Office of Production Management began to take form as a central agency to coordinate the defense program. A step toward more comprehensive direction was taken in the creation of the Supply Priorities and Allocations Board late in August 1941. The War Production Board, established in January 1942, inherited the powers of SPAB and OPM and was granted additional authority. None of these agencies gave general satisfaction or was entirely adequate. Discussion of the problem of central direction continued and was voluminous and heated but often neither perceptive nor helpful. It reached peaks of intensity at times when things did not seem to be going well. Congressional committees, newspaper editors, and critics of the administration came forward, from time to time, with plans to improve the administration of the war activities of the Government. Most of these reformers oversimplified the problem. the plan of action proposed was usually very simple: empower a single man to direct the war effort. Such a formula was a catharsis for frustration and persons hostile to the President took satisfaction from proposals which might deprive him of his powers as Chief Executive. Most of the advocates of this ready and simple remedy for the ills of the Government ignored or were quite unaware of the complexities of the problem for which they glibly proposed solutions. Some of them also would advocate with equal zeal the establishment of "cars" for particular segments of the economy apparently without realizing the inconsistency of advocating both a multiplicity of czardoms and a war effort tightly knit under central direction. Amateur administrative reformers were not alone in their erroneous estimates of how to manage the Government as a whole. The problem, in fact, was without precedent in the United States and plans and systems were the product of groping by fallible men into unfolding events. A common error of judgment was in the timing of advocated changes. Thus, those who in 1940 urged a highly centralized direction were demanding something which did not become really essential or possible until Pearl Harbor. Those who sought in 1942 still greater centralization of power within the Government were attempting to cope with problems which did not become critical until late in 1943. Though the development of machinery for the general direction of the Government paralleled the rise of conditions which required new types of general coordination, there was a lag in organizational adjustment caused by slowness in comprehending emerging conditions and in contriving administrative machinery to deal with them. In the early stages of the defense program one of the chief tasks of the President was to arrange the organization of Government to deal with forthcoming problems. By a fortunate coincidence of events the Executive Office of the President was established shortly before large-scale preparations for defense began. Its largest component, the Bureau of the Budget was charged, among other things, with assisting the President in dealing with problems of organization. Its work in this field was most significant in 1940 and 1941 and early 1942 when the basic administrative machinery for the war economy was being created. The Bureau of the Budget studied emerging problems that seemed to require additions to, or alterations in, the machinery of government. It reviewed proposals originating in the departments and formulated plans on its own initiative or at the specific request of the President. In other instances, it attempted, on behalf of the President, to negotiate agreement among the principal officials of the administration about changes in governmental machinery which were of concern to him. The extensive work of the Bureau in the development of plans for administrative organization, the drafting of orders for the establishment of new agencies, and the establishment of new agencies as working entities demonstrated the soundness of the judgment of the President's Committee on Administrative Management when it foresaw a need for greatly enlarged staff assistance to the president. the operations of these agencies could be directed and coordinated to achieve the broad national objectives imposed by the changing pattern of events. Organization for top direction of the Government was not an easy problem to solve at the times when it became critical. Nor is it one to be simply explained or described in retrospect. In seeking to understand the various measures taken to coordinate the work of Government in the war economy, two fundamental factors must be kept in mind. First, to assure the maximum war potential our resources had to be devoted to the purposes which would contribute most to our national strength. Second, a large number of agencies of Government had to make decision about the uses to which we put our resources. A few words of elaboration will perhaps make plain the significance of these propositions. Our resources; i.e., our manpower, our factories and machines, our ships and railroads, our minerals and materials, were scarce. With them we could not do everything that we wanted to do. We had to make choices. For example, would our military potential be strengthened more by using, say, 100,000 men to produce planes, to fight in the infantry, or to produce food for our allies? Of necessity, many Government departments and officials were concerned in settling such questions. The huge job of managing our resources had to be divided among many agencies. If one man could have passed on every question and seen that his decisions were executed, we would have had no problem of top management of the Government war agencies. That was manifestly impossible. Yet, if all agencies of the Government were permitted to proceed independently, the situation would be something like the operation of a single bank account on which many people were authorized to draw checks. The account soon would be overdrawn and there would be no means of seeing that the money was spent most efficiently in promotion of joint enterprises. Hence, there was the difficult task of organizing at some central point ways and means for directing the work of all agencies of Government in such a manner that their individual actions would conform to a grand design for the best use of our strength to win the war. number of tanks and planes, and the right quantities of ammunition. Or, to put the matter in another way, ammunition without enough guns or too many guns for the available ammunition would be wasteful. We must also have the proper tonnage of merchant shipping to transport our armies to the fields of battle and the correct naval strength to enable the Navy to perform the tasks assigned to it in the prosecution of war. The civilian population is as much a part of the fighting strength of the nation as the uniformed forces. Hence, we must have the proper quantities of food, clothing, shelter, and other essential goods to sustain the civilian population in order that the flow of weapons may be maintained. The mobilization of maximum strength requires also that our allies and friendly nations be furnished with military equipment and materials and supplies necessary to enable them to carry their part in the common effort. Our manpower has to be assigned appropriately to the military services, to industry and to agriculture. If proper decision are not made on all these questions, we might have a larger Army than our munitions industry can supply, a larger or a smaller merchant marine than necessary to carry the armies and materials which we have, too much or too little to maintain the civilian population, or a surplus in some things and a deficit in others. Decisions on all these matters must also be thought of in a perspective of time. Raw materials and human effort are not convertible into factories, guns, and ships overnight. We must plan ahead to make sure that we have arsenals to produce the right quantity of a given weapon at the right time. We must have housing completed for arsenal workers at the time they must be on hand to man the machines. All the equipment and supplies necessary for a particular campaign must be transported to the right place at the right time. THus, an extraordinarily complex flow of actions, from the mine, through the industrial system, to the battle front, must be taken in orderly sequence to focus our strength at the chosen times and places. To make the decisions affecting all these matters, there were many different agencies of Government. The War and Navy Departments had primary responsibility for obtaining the weapons and equipment necessary to perform the strategic tasks assigned to them. The Maritime Commission had responsibility for the development of the merchant marine. The Department of Agriculture had long been vested with responsibilities in planning the production of food and other agricultural products. With the threat of war, the permanent agencies of Government were supplemented by the creation of emergency organizations. The Department of State was paralleled by the Board of Economic Warfare and the Office of Lend-Lease Administration, both having heavy responsibilities in foreign economic affairs. Alongside the Department of Labor there was established the War Manpower Commission with broad authority for the mobilization of manpower for war purposes and the National War Labor Board with authority over industrial disputes. The Reconstruction Finance Corporation was supplemented by the Establishment of a group of subsidiaries to import strategic and critical materials and to finance construction of facilities to produce materials and other commodities. The problem of general management of the Government was to direct the work of all these agencies so that the end results would constitute the most effective utilization of our resources for war. We could use steel for tanks or ships or locomotives. We could use shipping space to bring in manganese, industrial diamonds or bananas. We could use manpower on the farm in the factory, or in the Army. The most acute thinking on how to gear together the decisions of all the Government agencies on these many questions was stimulated by American experience in the First World War. In his report on the operation of the War Industries Board, and in other writings, Mr. Bernard Baruch expounded the doctrine of priority as a synchronizing force. Some of the inadequate understanding of the significance of Mr. Baruch's broad ideas came from the popular use of the work "priority" to denote a piece of paper which entitled a many to buy a ton of aluminum. In fact, Mar. Baruch used the word in several senses. of requirements and supply also permits informed decisions on expansions of supply. Priority in the broad sense of the preceding paragraphs differs from the use of the priority power to control the flow of material and commodities through the production system. The flow of materials and commodities, of course, must be in accord with the general program of production but in this narrower sense, the exercise of the priority power means that the producer of copper, for example, is instructed by Government order, about the persons to whom he may deliver his product, and in what quantities. Or the producer of electric motors is instructed to deliver a certain portion of his output to a producer of Navy planes and another portion of his output to producers of refrigerators for use in housing in crowded war production areas. The priority power also is used to assign facilities to various types of production or to prohibit their use in the production of nonessential items. These devices contribute to the disciplining of the industrial system in line with requirements of the over-all economic program. In still another sense the term "priority" is used to describe a directive from one Government agency to another to assure operation in accordance with the central economic plan. Thus, the public employment agencies may be guided by a system of priorities in referral of available manpower. the procurement agencies may be limited in the quantities which they may purchase in keeping with the conclusions arrived at through the analysis of requirements and supply. Other governmental agencies which affect the operation of the economic system likewise may be governed by a system of directives or priorities calculated to synchronize the effects of all their operations. supply of materials, articles, and equipment and the provision of emergency plant facilities and services required for the national defense, and (2) to insure effective coordination of those activities of the several departments, corporations, and other agencies of the Government which are directly concerned therewith. When the Office of Price Administration and Civilian Supply was established in April 1941, an attempt was made to define its powers in such a manner that its allocation work would be coordinated with the work of the Office of Production Management. OPACS was to allocate among civilian uses the residual supply which remained after military and other defense requirements were met. Thus OPACS might determine whether the available supply of steel for civilian use should be used in the manufacture of locomotives or threshers. A next step in the development of machinery for coordination of activities of the Government was taken in establishment of the Supply Priorities and Allocations Board late in August 1941. By this action, a policy board, representative of the major agencies concerned with the defense program, was superimposed over the Office of Production Management and the civilian allocation function of OPACS was transferred to the Office of Production management. SPAB was directed to "determine the total requirements of materials and commodities needed respectively for defense, civilian, and all other purpose; establish policies for the fulfillment of such requirements, and, where necessary, make recommendations to the President relative thereto." The Board included the heads of the agencies primarily concerned with industrial production: the Secretary of War, the Secretary of the Navy, the Special Assistant to the President supervising the defense-aid program and the Chairman of the Economic Defense Board. In addition, the Director General and Associate Director General of the Office of Production Management and the Administrator of the Office of Price Administration were members. The Board thus was designed to bring together the responsible officials concerned with the military sphere, with civilian supply, and with export and economic warfare policy. The implicit theory was that a unified policy would emerge from this type of administrative machinery. of the Government's program. The Office of Production Management, subject to the policies of the Board, was authorized "with reference to specific priority authorities vested by law in established departments and agencies of the Government" to "certify to such departments and agencies, when the Office of Production Management deemed such action necessary to national defense, that preferential treatment is essential for certain materials, commodities, facilities, or services." OPM also was authorized to determine priorities to be followed by the Maritime Commission in the allocation of import space on merchant vessels. Under administrative arrangements developed during the summer of 1941, the detailed findings of OPM, derived from analysis of requirements and supply, could be transmitted to the Maritime Commission for its guidance in lifting cargo for import. The Executive order was silent on the relationship of the Board to the Reconstruction Finance Corporation and its subsidiaries which financed the construction of plants and the acquisition of materials. It was essential that these activities be conducted in accordance with the findings of the analysis of supply and requirements; working arrangements were in existence, although they did not operate without friction. The correction of this kind of situation probably was contemplated by the clause of the Executive order which provided that the Board should establish policies for the fulfillment of requirements and "where necessary, make recommendations to the president relative thereto." After Pearl Harbor, it became possible to take further steps in organization for coordination and on January 16, 1942, the War Production Board was established. The Board inherited the powers of the Office of Production management and of the Supply Priorities and Allocations Board. Its powers were vested in the Chairman of the Board, who was advised by the members of the Board, which consisted, among others, of the Secretary of War, the Secretary of the Navy, the Federal Loan Administrator, the Price Administrator, the Chairman of the Board of Economic Warfare, and the Special Assistant to the President supervising the defense aid program.1 The Chairman of the Board was authorized to "exercise general direction over the war procurement and production program" and to "determine the policies, plans, procedures, and methods of the several Federal departments, establishments, and agencies in respect to war procurement and production." He also was authorized to exercise all the powers which had theretofore been vested in the predecessor agencies. War Production Board were challenged by other Government agencies. The opposition, led by the War Department, did not subscribe to the doctrine that war is too important a matter to be left to the military. Scarcely had the War Production Board begun operations when the War Department proposed a reorganization of WPB and hotly criticized the Chairman of the Board. In the summer of 1942, the Joint Army and Navy Munitions Board almost succeeded in a coup to require its concurrence in the principal actions by the War Production Board. Thus was inaugurated a running fight between the War Department and the War Production Board which was to continue for several years. It was fought through the press by spokesmen for the War Department, who consistently sought to create an attitude which belittled the principal officials of WPB and challenged its technical ability. Under cover, other efforts were made to bring about the removal of WPB officials and to undermine their status within the Government. Apart from the more or less inevitable resistance of the military to civilian control from any source, the powers vested in the War Production Board and the general theory of one-man control of the allocation of our industrial resources were subject to limitations which had not been clearly foreseen. If the Chairman of the War Production Board could determine in his own right the resources which the military agencies received, he could determine what kind of war was to be fought. He could, for example, have determined the relative emphasis upon military effort in the air and on the ground. he would have become, in effect, Commander in Chief. The determination of questions of broad strategy had to be reconciled with the power of the Chairman of the War Production Board for the coordination of our industrial effort by agreement with the Joint Chiefs of Staff, a mechanism for the coordination of military operations. If its became impossible, by pinching other segments of the economy, to meet the needs of all aspects of proposed military programs, the Joint Chiefs of Staff would determine what adjustments should be made among the various elements of the military production program. experience should be brought to bear on spare planning as soon as practicable. If a greater quantity of bombs was scheduled to be manufactured than possibly could be transported by the bomber force to be available, that discrepancy could be pointed out. Continuing searching criticism often brought appropriate alterations by the military agencies. The War Production Board also checked carefully the estimates of the military agencies of the materials and components which would be required to meet their needs. This review, however, was no different from that applied to the programs of the nonmilitary agencies of the Government. These estimates usually were inflated, although one should not underrate the technical difficulties of computing, for instance, what quantities of alloy steel had to be put into proper production channels during a particular three-month period if one were to have a specified number of tanks on hand at a given time in the future. Nevertheless, in the review of requirements it was often possible to reduce requests for steel, for example, without actually affecting the scheduled output of tanks or airplane motors. If the power of the Chairman of the War Production Board had been carried to the limits expected by those seeking one-man control, he also would have been vested, in effect, with power to determine our economic foreign policy. He could have determined the magnitude of our lend-lease assistance to various of our allies and associates and the nature of our program of economic warfare. The War Production Board was handicapped in its developmental stages by defects in administrative technique. It was naive to suppose that the Chairman of a War Production Board could sit at a table with the top officials of other agencies and determine the strategy for utilization of our economic resources. That job required the collaboration of literally thousands of men. The fundamental problem of technique was that of making sure that the broad decisions allocating large slices of our resources for various purposes were made effective through mechanisms for the detailed control of the flow of resources through the economic system and for the distribution of its products among different purposes. In this, the experience of the first World War was practically useless since the priorities procedures of that day were primitive in contrast with the refined techniques eventually developed by the War Production Board. By the end of 1942, there evolved the controlled-materials plan which was an effective method of executing broad allocation decisions in detail and of maintaining an effective control over the operations of each of the agencies of Government authorized to draw upon our resources. The upshot of the evolution of the War Production Board was that it became not so much a center of leadership and policy initiative in the Government as a point at which total resources could be determined and the limitations on what could be done defined. Within the boundaries fixed by analyses by the War Production Board, it was possible for decisions to be made by the President, by the Joint Chiefs of Staff, and by negotiation among the agencies of Government. The coordinating procedures of the Board would show when it was impossible to carry out all proposed programs. Some programs had to yield and in some instances, WPB determined which was to yield. In other instances the decision was made at a higher level. was attributable to the fact that in World War I no real program of economic stabilization had been executed. Prices generally were allowed to rise without effective restraint. In World War II a radically different policy was followed and it eventually became necessary to establish a system for the overhead control of the agencies of Government concerned with maintenance of a stable price level. The separate network of supervisory control over stabilization agencies resulted in part from the policy of withholding power to control prices from agencies concerned with production. This policy was based on the fact that agencies of Government tend to represent the interests of a constituency rather than to speak for the general welfare. The industry divisions of the War Production Board, for example, ordinarily were closely attached to the interests of the industries with which they were concerned. The Department of Agriculture has won no reputation for restraint in the advocacy of the interests of the farm population. It was believed that vesting control over prices in agencies closely affiliated with groups which desired price adjustments might result in an "easy" price policy. The strategy in the creation of an Office of Price Administration was to avoid these risks and to establish an administrative structure consisting of persons with an institutional interest in price stabilization. The denial of the power of price control to agencies with a marked orientation toward an important clientele was criticized by both Congress and the public. It was urged persistently in Congress that the power of fixing prices of agricultural commodities should be placed in the Department of Agriculture and organizations of farmers were favorable to the vesting of this authority in the Secretary of Agriculture. The Price Control Act, adopted in January 1942, provided that no prices might be fixed "with respect to any agricultural commodities without the prior approval of the Secretary of Agriculture." This legislative provision immediately created a problem of coordinating the activities of the Office of Price Administration and the Department of Agriculture. raised significantly by a price increase. Price incentive was thought to be more important in the production of military goods and the procurement agencies were, for all practical purposes, free to offer what was necessary to induce production. In some fields, price adjustment did have some utility in causing minor adjustments in output by preventing the drift of workers, for example, from low-wage industries whose output was essential. In agriculture, price management is much more important in the manipulation of production than in manufacturing. These and other considerations stimulated a drive in 1942 by production agencies to acquire powers of price fixing over commodities in which they were interested. generally the adjustment of prices to meet the needs of the production agencies was handled by negotiation between the agency concerned and the Office of Price Administration. In a few situations, however, formalized arrangements for consultation existed. Thus, the Premium Price Quota Plan Committee was a joint WPB-OPA group which determined what increases in production of copper, lead and zinc by individual mines would be necessary in order to qualify for premium price payments by the Metals Reserve Company. By this sort of subsidy, increased output of particular commodities might be stimulated without raising their prices generally and by such administrative arrangement the views of both the production planning and price control agencies might be blended. Often, however, interagency agreement could not be reached by negotiation and it was necessary for differences to be settled by the President or by some person acting for him. Furthermore, the maintenance of a general stabilization policy required some means for controlling wage policy and for managing tax and borrowing policy in harmony with price-control policy. became clear that the operations of all of these and other agencies had to be subjected to some central direction if their efforts were to contribute effectively to the prevention of excessive price rises. Earlier authority having been inadequate, the President in September 1942, demanded the enactment of legislation to enable him to prevent a rise in the cost of living. A bill approved October 2, authorized the President "on or before November 1, 1942, to issue a general order stabilizing prices, wages, and salaries affecting the cost of living; and, except as otherwise provided in this act, such stabilization shall insofar as practicable be on the basis of the levels which existed on September 15, 1942." In executing this act, the President had the alternative of supervising the Government agencies concerned himself or of creating a special assistant to act on his behalf. He chose the second alternative and on October 3, 1942, established in the Executive Office of the President an Office of Economic Stabilization headed by a Director of Economic Stabilization. The Director was instructed to advise with an Economic Stabilization Board consisting of the Secretaries of the Treasury, Agriculture, Commerce, and Labor, the Chairman of the Board of Governors of the Federal Reserve System, the Director of the Bureau of the Budget, the Price Administrator, the Chairman of the National War Labor Board, and two representatives each of labor, management and farmers. To give effect to the policy of economic stabilization he was empowered to issue directives on policy to the Federal departments and agencies concerned. The Executive order also contained specific provisions relating to significant types of coordination which had to be effected if the actions of the individual agencies were to fit together. For example, if the War Labor Board or the Price Administrator believed that a proposed wage increase might require a change in the price ceilings of the commodity or service involved, the proposed increase would become effective only if approved by the Director of Economic Stabilization. Disagreements between the Secretary of Agriculture and the Price Administrator over agricultural prices were to be settled by the Director. The Reconstruction Finance Corporation, the Commodity Credit Corporation and other governmental agencies were made subject to instructions by the Director with respect to the subsidization of any commodity to insure maximum necessary production or to prevent price rises. In operation the Office of Economic Stabilization consisted of the Director and only a handful of assistants. Its physical location in the White House had the effect of giving notice to the agencies and departments that its operations were supported by the President. Although the Office had been instructed in its Executive order to formulate and develop "a comprehensive national economic policy relating to the control of civilian purchasing power, prices, rents, wages, salaries, profits, rationing, subsidies, and all related matters," it actually operated more after the fashion of a court of appeal. It waited for conflicts to develop between agencies and then, on the basis of such information as it could accumulate, make a decision. Events in late 1942 and the first half of 1943 placed a great strain on the price ceiling and illustrated the role of central machinery in leading the fight for economic stabilization. Operations under the order of October 1942, did not stop the rise in the cost of living. By April 1943, it had risen approximately 6.2 percent above the level of September 1942, at which Congress had said prices and wages should be stabilized. Food prices generally were up 13 percent and the retail prices of fresh fruits and vegetables were 58 percent above the levels of September 1942. Farmers and the Department of Agriculture were dissatisfied with prices for agricultural commodities. Labor unions sought wage increases to meet rising costs of living. The situation was made more complex by congressional intervention and threatened intervention and by difficulties within the administrative agencies. A high order of politico-administrative tightrope walking was required to maintain a political and economic equilibrium. Chart 46. 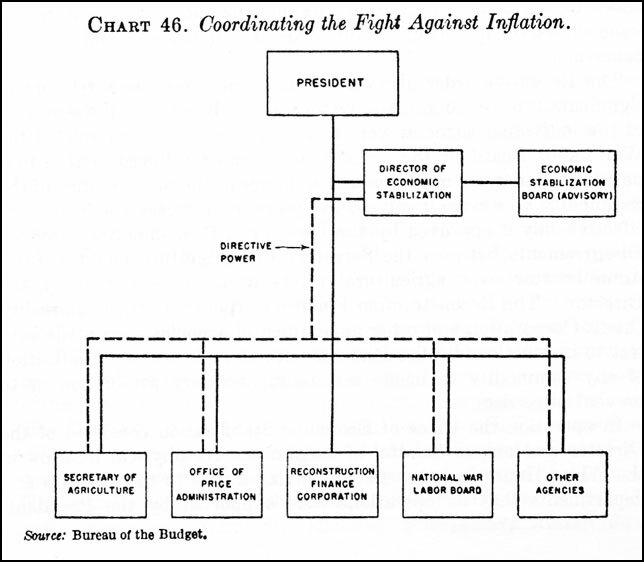 Coordinating the Fight Against Inflation. The Office of Price Administration, which had primary responsibility for holding down prices, at times seemed to be on the verge of collapse. Leon Henderson resigned as Price Administrator on December 18, 1942, amid charges that the OPA had been responsible for Democratic losses in the 1942 congressional elections. Former Senator Prentiss M. Brown was sworn in as Price Administrator on January 18 and, in accordance with the President's instruction, began a campaign to bring OPA through congressional investigations with an appropriation sufficient to finance the price-control job. During the next three months OPA was deluged with appeals for price increases from businesses which interpreted Henderson's resignation as a sign that price controls were to be relaxed. Dozens of appeals were made by Congressmen on behalf of their constituents. Staff of the OPA, brought into the agency by Senator Brown, carried on a running fight in the press against other officials of the agency. Observers of the OPA reported: "It takes longer than ever before to acton important questions of policy . . . OPA is in danger of being discredited with the trade for its toughness, discredited with labor and the consumer for its softness, and discredited with its own personnel for the absence of direction and the vacillation in vital matters." As the cost of living increased and farm pressure groups marshaled their strength in Congress, a wage crisis developed in the demands of the United Mine Workers of America for higher wages to offset the rising cost of living. With price and wage controls threatened, the President on April 8, 1943, issued his "Hold-the-line" order which provided for better coordination of wage and price controls and also set forth more definite policies to guide the War Food Administration, Office of Price Administration, and War Labor Board. Machinery for coordination was strengthened by delegation to the Director of Economic Stabilization of all powers and duties conferred upon the President by the Stabilization Act of October 3, 1942. The Director of Economic Stabilization was authorized and directed to take such action as he deemed necessary "to stabilize the national economy, to maintain and increase production and to aid in the effective prosecution of the war." The order directed: (1) the Price Administrator and the Food Administrator "to place ceilings on all commodities affecting the cost of living . . . to reduce prices which were excessively high, unfair, or inequitable," and in the future to grant price increases only to the "minimum extent required by law"; and (2) the National War Labor Board and the Commissioner of Internal Revenue to "authorize no further increases in wages or salaries except such as are clearly necessary to correct substandard of living" or to compensate "for the rise in the cost of living between January 1, 1941, and May 1, 1942." acceptance of employment by a new employee except as authorized in accordance with regulations" issued by the Chairman of the War Manpower Commission with the approval of the Economic Stabilization Director, "for the purpose of preventing such employment at a wage or salary higher than that received by such new employee in his last employment unless the change of employment would aid in the effective prosecution of the war." Meanwhile, Congress held the vetoed Bankhead bill in committee as a threat to the stabilization program. Action by Congress assuring higher food prices would have been an open invitation to the United Mine Workers to press their wage demands to the utmost. The contract between the union and the bituminous mine operators expired on March 31, and the union demanded a new contract which would provide a basic wage increase of $2 per day, an increased vacation bonus, portal-to-portal pay, and a 6-day-week guaranty. these demands were clearly in conflict with the stabilization program and the "Hold-the-one" order. Negotiations between the union and the mine operators, in which conciliators of the Department of Labor participated, broke down and the dispute was certified to the War Labor Board. The union refused to send representatives to a preliminary hearing called by the Board on April 24 and it seemed that the Board might not be able to survive the labor dispute. The President appealed to the miners to stay on the job; and the War Labor Board ordered the striking miners to return to work. But by May 1, approximately 400,000 miners were out on strike and mining operations had virtually stopped. On May 1, 1943, the President directed the Secretary of the Interior to take over and operate the coal mines in the name of the United States Government and shortly thereafter some 3,400 bituminous mines were under Government operation. On June 23, union officials instructed workers to return to the mines and, contingent upon continued Government operation, to remain at work until october 31, 1943. By October 12, however, it was possible to return to private operation all the seized mines. had opposed passage of bills to increase farm prices. "Today we are faced with a crisis on the wage front . . . and I am compelled to point out that if this wage increase [to the mine workers] is granted, increases cannot be denied to workers in other industries and increased prices cannot be denied to farmers. These increases in wages and in farm prices can only mean further rises in the cost of living. What will it profit workers to have more dollars in their pay envelopes if it takes all these extra dollars, and perhaps more, to feed and clothe their families?" During May and June, OPA moved on each of these fronts. By the end of June, dollars-and-cents maximum prices, covering, on the average, about 1,000 grocery items, had been established on approximately 200 major cities. Ceiling prices were placed on 22 commodities and on food and beverages sold in restaurants. Prices of 39 commodities were "rolled back. "7 A survey was conducted by 200 investigators in 250 coal mining communities to determine the extent of violation of OPA price regulation. Chart 47. Food Subsidy Payments. coffee, and butter. The Price Administrator announced that, to prevent these reductions from affecting production adversely, "he was recommending to the Secretary of Commerce that subsidy payments be made to processors of the commodities involved." Economic Stabilization Director Byrnes stated that the program had his "full approval and that he was asking the Secretary of Commerce to take the necessary steps to carry it into effect. "8 The "roll back" subsidies were to go into effect on June 1 and the total cost of the program was estimated at $400 million. Opposition to the "roll back" program developed quickly. Representatives of retail distributors predicted "complete demoralization if not annihilation. "9 The House of Representatives voted 160 to 106 to terminate the roll back subsidy program on July 1 and to prohibit future use of subsidies for the purpose of holding down consumer prices.10 Price Administrator Brown informed a skeptical Senate Banking and Currency Committee that it would be impossible for the Office of Price Administration to "implement the mandates of the Price Stabilization Act without using Federal subsidies to 'roll back' agricultural prices." He pointed out that the Stabilization Act specified September 15 levels for retail prices, required fair and equitable margins for processors and distributors, and fixed parity as a minimum below which prices could not be set. without adequate time to act before shortages became serious. it became involved in disputes with the War Production Board, the Petroleum Administration for War, and the War Food Administration over such questions. The inadequate appreciation by the allocating agencies of the problems of rationing came in part from a lack of knowledge of the technical problems of rationing, from a lack of concern for the interest of the consumer, and from fear that rationing might result in the disturbance of preexisting patterns of distribution within the industry. The office of Petroleum Coordinator, for example, in 1942 fought the introduction of gasoline rationing, in part because it failed to see the need for rationing, and in part because of its desire to maintain the existing allocation of business among distributors. The potential effect of the desire of OPC to maintain the pattern of distribution was demonstrated by the temporary rationing measures undertaken in 1942 which allocated to filling stations a uniform percentage of their earlier intake. The consequence was that some stations had more gasoline than they could sell and others had a totally inadequate supply. OPA contended that rationing programs should assure a distribution of the rationed commodity in accordance with consumer needs as shown by the use of ration coupons. The existence of such issues between OPA and the allocating agencies created a need for a common superior to settle them. With the creation of OES such a superior at a subpresidential level came into existence. OES was given further powers by the Executive order of December 1942, vesting control over food in the Secretary of Agriculture. that order attempted to divide the priority power between WPB and the Secretary of Agriculture. It was impossible, however, for both the Chairman of WPB and the Secretary of Agriculture to determine the allocation of steel and other products between agricultural and other uses. Under this order, the Secretary of Agriculture might come into conflict with the Chairman of WPB in several areas. For example, the Chairman of WPB might not grant enough farm equipment to meet the requirements of the food program as seen by Secretary of Agriculture. The two officials might not agree on the division of import space between foods and nonfood commodities. The order provided that disagreements between the Secretary of Agriculture and the Chairman of WPB would be settled by a person designated by the President, who named the Director of Economic Stabilization. WPB to other agencies to deal with many detailed questions. PAW, for example, by the Executive order of December 2, 1942, was given broader authority over the petroleum industry. It became a claimant agency before WPB for the material and equipment necessary to maintain the petroleum industry. that is, PAW estimated the quantities of machinery, piping, and other supplies necessary to produce the required quantities of petroleum. These estimates were justified by the presentation of data showing what would be done with the requested equipment and material. The request of PAW was placed by WPB alongside the requests of all other agencies and appropriate adjustments made to bring total demands into balance with anticipated supply. Necessarily, this meant that WPB could decide the level of operation of the petroleum industry by determining the materials and equipment to be available for its operations. Further, insofar as allocation of the products of the petroleum industry was necessary, procedures were devised by which WPB would intervene only when necessary to bring PAW actions into accord with the general war program. Similarly, the Department of Agriculture prepared estimates and justifications for farm equipment. The Office of Defense Transportation prepared estimates of needed transportation equipment and justified them by relating them to anticipated transportation requirements. The National Housing Agency, although not formally designated as a claimant agency, made studies of the need for housing in war production centers and presented to WPB estimates of what it would take to meet these requirements. Once the broad decisions were made by WPB, NHA through its subsidiaries was permitted to make the detailed decisions about what type of housing should be constructed and who should build them. direct military effort. These agencies were disposed to advocate what their constituencies desired. All of these things conspired to make the position of the WPB Chairman extremely difficult and pointed toward the need for some official at a higher level who might be able to settle these disputes, if not to the satisfaction of the advocates of particular causes, at least in a manner so authoritative that they would keep quiet. The Chairman of the War Production Board was in the unhappy position of not being able to satisfy everybody. He was battered, abused, and cajoled by other agencies of the Government. Instead of being an official of infinite wisdom and endless knowledge surveying the national scene from an Olympian vantage point and assigning our economic strength where it would do the most good-0-as envisaged by some of the speculators on industrial mobilization--he became the much-abused referee of a free-for-all fight among agency heads who knew no rules and were not above loading their gloves with Congressional blocs, pressure groups, and an occasional chit initialed by the President at their urging. The tendency to place greater authority in commodity czars stimulated a move for another type of overhead coordination. This was an effort to establish in independent agency cornered with civilian supply. It originated with the Office of Civilian Supply of the War Production Board. This office was the lineal descendant of the Office of Price Administration and Civilian Supply whose civilian supply functions were inherited by the Division of Civilian Supply of the Office of Production Management and eventually by the Office of Civilian Supply of the War Production Board. Its functions were to estimate the needs of the civilian population and to advocate them before the allocating committees within the War Production Board. In the early stages of the life of the War Production Board, the Office of Civilian Supply operated principally as a gadfly to expedite the conversion of industry to war production. At the outset, it was not a defender of the civilian interest except in the sense that the acceleration of war production coincided with the national interest. and make efforts to obtain allocations in accordance with its judgment of civilian needs. It was thus vested with the extremely important function of studying what was required to maintain the home front and of attempting to see that military and export demands were not carried so far as to impinge on the domestic production system. With the rise of the czars and the evolution of the controlled materials plan with its system of claimants, the Office of Civilian Supply became the advocate only for certain residual civilian needs, i.e., supplies not within the jurisdiction of some other agency. The Office of Defense Transportation estimated transportation needs of the civilian population and sought to obtain the materials and equipment and manpower necessary to maintain that level of transportation. 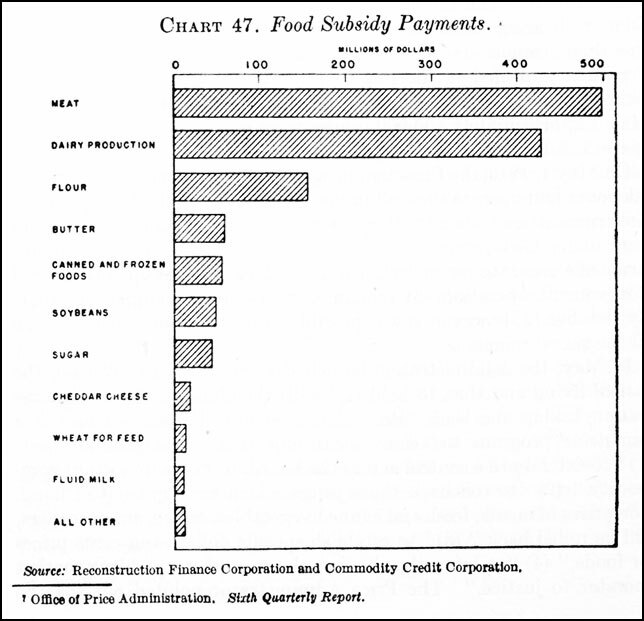 A subdivision of the Department of Agriculture estimated the needs of the civilian population for food and presented those claims in competition with military and export claims. The Petroleum Administration for War determined the quantities of fuel which were made available to the civilian population. The War Manpower Commission, as far as it had power to allocate the labor force, determined how manpower would be employed in the production of good and services for the civilian population. The Director of the WPB's Office of Civilian Supply in December 1942, informally proposed an Executive order to establish under the Office of Economic Stabilization an "Office of Civilian Supply for representation of the civilian economy in the war administration." This office would have estimated requirements for maintenance of the civilian economy and it would have been empowered, through the Economic Stabilization Director, to issue directives to all agencies of the Government concerned with allocation of resources to civilian uses. The scheme was posited on the assumption that the prospects for good for civilian use in the coming months were dark and drastic steps were necessary to assure a proper minimum. Supply and elevated its chief to the position of Vice Chairman for Civilian Requirements. This agitation for greater control over the civilian economy did result in a specialized form of Nation-wide control. On the home front, the effects of rationing, production control, price fixing, construction of essential public works, and other activities all eventually made themselves felt in individual communities. It was extremely difficult to foresee from Washington all the things that needed to be done in a particular community in order that its contribution to the promotion of the war might be most effective. Problems arose especially in areas which had become congested as a result of expansion of war production or other war-connected activities. The Secretary fo the Navy became concerned about conditions around port areas such as Portland, Maine; Newport, R.I.; Hampton Roads, Va.; San Diego and San Francisco. On the basis of surveys made for him, the Secretary of the Navy recommended to the President that he establish a coordinating committee with power to bring about the necessary coordination of Federal agencies in congested areas and to stimulate concerted work of Federal and local agencies. On April 7, 1943, the President set up the Committee for Congested production Areas consisting of the Director of the Bureau of the Budget as Chairman and one member from each of the following agencies: War Department, Navy Department, War Production Board, Federal Works Agency, National Housing Agency, War Manpower Commission. The Committee through its directed designated an area director for each area which was found to be congested. The area director observed the progress of all Federal agencies in his area, and, through local channels or through the Washington office of the Committee, stimulated actions needed to cope with pressing problems in the locality. Through the members of the Committee it was possible to bring to the attention of high level officials in Washington matters within the jurisdiction of their agencies which had been neglected or which required more expeditious action than had been obtained. on an inquiry into the overhead direction of the war effort. It concluded that questions of economic stabilization, production strategy, and manpower policy were being settled in separate compartments by the Office of Economic Stabilization, the War Production Board, and the War Manpower Commission. It observed that the Office of Economic Stabilization limited itself "to curative rather than preventive action." It recommended that there be established a War Mobilization Board which would formulate and submit to the President for his approval a comprehensive program for "mobilization and maximum utilization of the Nation's resources for the supply of military forces and essential civilian need." The Chairman of the Board would have been empowered, with the approval of a majority of the Board, to issue instructions and orders to the Executive departments and agencies. This report of the committee and other contemporary discussions were stimulated in part by extensive disputes among the various production czars in the early months of 1943 over the relative urgency of production programs in which they were interested. To develop unified programs and to establish policies for the maximum use of the Nation's natural and industrial resources for military and civilian needs, for the effective use of the national manpower not in the armed forces, for the maintenance and stabilization of the civilian economy, and for the adjustment of such economy to war needs and conditions. To issue such directives on policy or operations to the Federal agencies and departments as may be necessary to carry out the programs developed, the policies established, and the decisions made under this order. It shall be the duty of all such agencies and departments to execute these directives, and to make to the Office of War Mobilization such progress reports as may be required. Chart 48. Coordination of the War Agencies. The Director of Economic Stabilization, James F. Byrnes, was elevated to the position of Director of War Mobilization. His duties did not change markedly except that some of the purely stabilization matters continued to be handled by the Director of Economic Stabilization while the flow of more general questions to him increased in volume since his authority to deal with them had been formalized by the Executive order. The War Mobilization Committee did not constitute an effective instrument for consideration of questions. It was found more effective to bring together from time to time representatives of agencies interested in particular questions to consult with the staff of the Office. Chester C. Davis, the Food Administrator, also believed that the various agencies responsible for parts of the food program should be pulled together. He was especially perturbed by the way in which food price and rationing policies were worked out by staffs of the Office of Price Administration and the Office of Economic Stabilization. Mr. Davis had been assured by the President that he would have authority commensurate with his responsibilities as Food Administrator and that he would report to the President. instead, he found that food price and rationing authority was exercised by OPA and that he was responsible to the Director of Economic Stabilization. The roll-back subsidy program had been worked out by the staff of OPA and EOS without consultation with the Food Administrator's staff. Mr. Davis, through an oversight, was not informed of the decisions that had been made, learned of the subsidy program through a radio announcement. On June 28 the resignation of Chester Davis as Food Administrator and the appointment of Marvin Jones as his successor were announced. The announcement came about 10 days after a conference between the Director of Economic Stabilization, the Director of War Mobilization, the Price Administrator, and the Food Administrator over the way in which food policies were being determined. mr. Davis protested that he had been given responsibility for the food program, but that others had authority and exercised it without consulting him. Byrnes and Brown both agreed with Davis' opposition to the general subsidy program which the President had announced. But the general discussion was unsatisfactory and Davis expressed a desire to see the President to "talk things over." Byrnes discussed the situation with the President and Davis' resignation was accepted. Davis was not given an opportunity to talk with the President. One of the first major questions with which the Office of War Mobilization dealt was the problem of gearing together the activities of WPB and WMC. It has been noted that, under the general theory of WPB, it would have been able to indicate to WMC the order of priorities which should be followed in referral of available manpower to civilian employment, and, likewise to indicate to Selective Service considerations of labor supply for its guidance in the withdrawal of manpower from the labor market for the Armed Forces. WPB attempted to work out a relationship of this sort with WMC but encountered difficulties. The Executive order establishing WMC, in fact, empowered the Commission to "estimate the requirements of manpower for industry; review all other estimates of needs for military, agriculture, and civilian manpower; and direct the several departments and agencies of the Government as to the proper allocation of available manpower." On the basis of its Executive order, WMC questioned the authority of WPB to instruct it with respect to labor priorities. were claiming authority to establish unilaterally the drafts which they would make on the total manpower supply. The Selective Service Administration, which was the only agency with authority actually to control the use of manpower, was not disposed to discourage the congressional point of view that it should operate autonomously. Congress itself entered the field of manpower allocation by enactment of special measures to maintain the existing labor force in agriculture. All in all the mechanisms and procedures for assuring that manpower was assigned to the places where it was most needed were quite inadequate and poorly coordinated. Early in September 1943, OWM issued a directive which provided for the establishment of special machinery and procedures for assignment of manpower in certain congested areas of the West Coast. The procedure, eventually was extended to other areas as is described in Chapter 14. 1. At the outset the Board also included the Director general and the Associate Director General of the Office of Production Management. With the abolition of these offices these officials ceased to be members of the Board but subsequently other officials were added to its membership. 2. See Senate Report No. 10, pt. 14, 78th Cong., 1st sess. (Jan. 8, 1944). 3. Congressional Record, vol. 89, pt. 2, p. 2272. 4. Executive Order No. 9250, title IV, section 2, Oct. 3, 1942, 7 Federal Register 7871. 5. Congressional Record, vol. 89, pt. 2, pp. 571, 632, 1308, 2438, 2826. 6. Congressional Record, vol. 89, pt. 2, pp. 2828-30. 7. Office of Price Administration, Sixth Quarterly Report. 8. OPA Press Release No. 2466, May 7, 1943. 9. New York Times, May 19, 1943, p. 1, col. 3. 10. Congressional Record, vol. 89, pt. 5, p. 6124. 11. New York Times, June 17, 1943, p. 10, column 3. Copyright article by Alfred M. Landon. 12. New York Times, Jun 16, 1943, p. 1, column 2. Report on June 15 White House press conference. 13. New York Times, June 25, 1943, p. 10, column 4. Views of the Chairman of the Food Industries War Committee and President of the General Foods Corp.